Telangana Gurukulam Inter First year admission notification is released for the academic year 2020-21 in TSWREIS, TTWREIS Institutions. Candidates can fill the TS Gurukul JC CET 2020 Online Application Form by clicking on the link attached below. 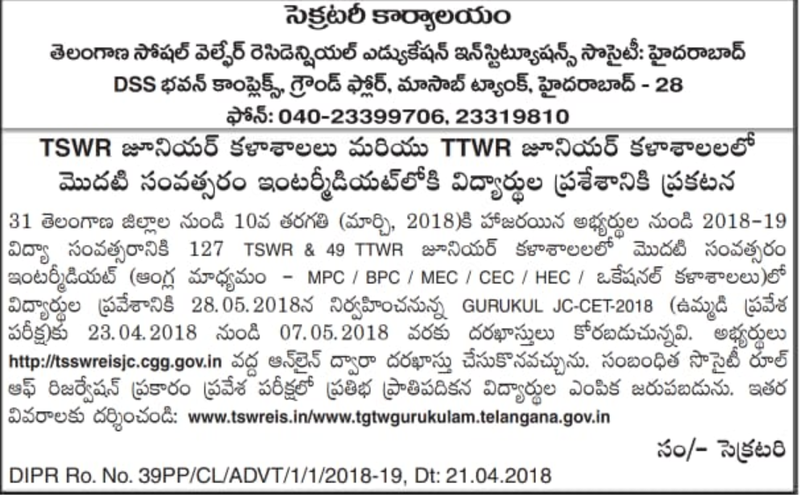 TSWREIS, TTWREIS Inter 1st year Admissions 2020-2021 application form from the official site tsswreisjc.cgg.gov.in. Online registration has already started from 23rd April 2020; fill and submit the form on or before 7th May 2020. TS Gurukul RJC CET Exam Date : Telangana Gurukul JC CET 20120 will be conducted on 28 .05.2020 from 10.00 AM to 12.30 PM. Examination Centers: TSWR and TTWR schools in the district based on applications received. Must have passed the qualifying examination in first attempt in March, 2020 as regular candidate . Question paper shall be issued in Telugu/English (bilingual) only. 10. Test will be conducted in Objective type (Multiple Choice) for 150 Marks (30 marks each for English, Maths, Physical Science, Bio-Science and Social Studies irrespective of groups. The duration for the test is 2½ hrs. 11. The Model Question papers are available in the Website: www.tswreis.in. Syllabus : The question papers of GURUKUL JC-CET will be based on 10th standard in Telangana state syllabus for subjects and English will be General English.